Calgary-Centre By-Election called for November 26, 2012. 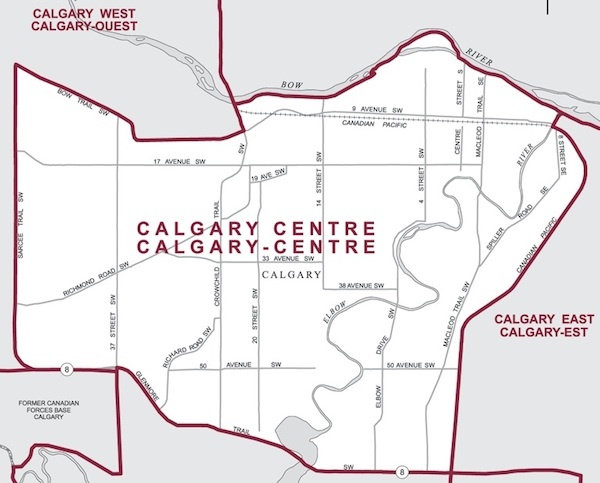 Map of the Calgary-Centre federal riding. A by-election will be held in the federal riding of Calgary-Centre on November 26, 2012. The by-election is being held to replace former Conservative Member of Parliament Lee Richardson, who resigned earlier this year to become Premier Alison Redford‘s Principal Secretary. Four candidates have been nominated to run in the by-election: Ben Christienson (Progressive Canadian), Joan Crockatt (Conservative), Harvey Locke (Liberal), Chris Turner (Green). Three New Democrats will seek their party’s nomination scheduled for October 27 October 23. The NDP nominees are Brian Malkinson, Matthew McMillan, and Dan Meades. To assist Calgary-Centre voters in making their decision about who to cast their ballot for, I have created a special webpage with information and links to the candidates websites and social media profiles. This entry was posted in Alberta Politics and tagged Ben Christienson, Brian Malkinson, Chris Turner, Dan Meades, Harvey Locke, Joan Crockatt, Matthew McMillan on October 21, 2012 by Dave Cournoyer. Thanks Dave for putting that link together. I live in the riding. This will be an interesting race. Joan Crockett is working hard door knocking and meeting potential voters everywhere she can. Chris Turner is busy meeting people at coffee parties and other gatherings, putting in the time to convince voters that the Greens are more than a one-trick pony. Harvey Locke’s team is up and running as well. The NDP have a long way to go to catch up. Of course the big challenge will be to get enough progressive votes behind ONE candidate to take out the PCs.